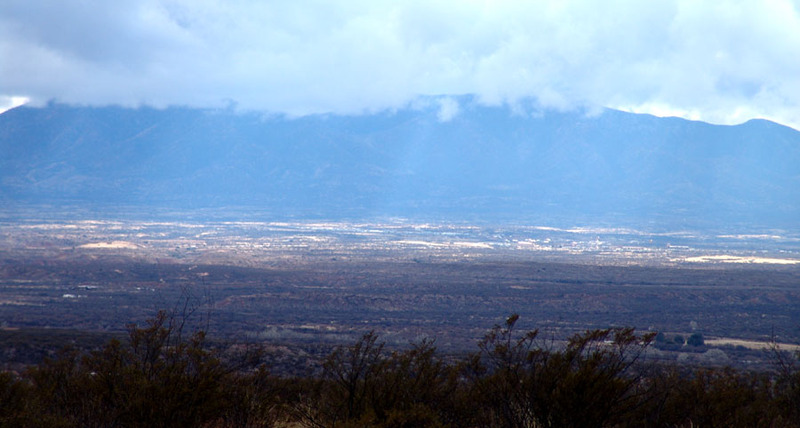 Above, the Whetstone Sky Island, its summits obscured by afternoon clouds on January 19, 2007, looms above the city of Benson Arizona on the flanks of the San Pedro River. The view is from Cascabel Road near milepost 5. Note: For detailed map orientation, scroll to the bottom of the page. Below, a panoramic view of the Mountains, taken in 3 images on September 2, 2008 from various points along the Apache Powder Road. Click on each image to enlarge it. Note in the image above the pinkish cliffs running the full sweep of the picture. These cliffs mark the edge of the very extensive Whetstones bajada, and they are Upper Miocene Epoch (7 to 5 million years ago) lakebeds of the "St. David Basin", and are widely exposed in the visinity of Benson. See this link for further information: Upper Miocene Closed Basins. 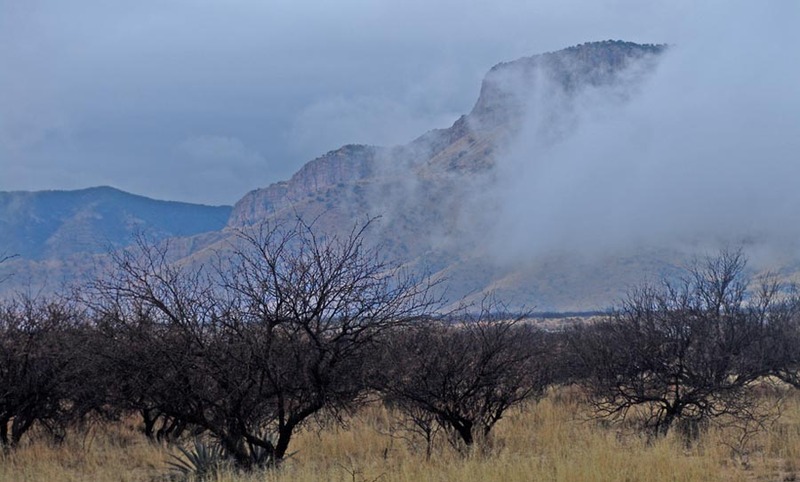 The highest point on these mountains is Apache Peak at 7,711 feet above sea level, rising from a Chihuahuan Ecoregion grassland (or Apache Highlands Grasslands) pediment at about 4,900 feet to open oak-juniper woodland on higher slopes. It does not hold the full range of Sky Island vegetation stacks attained by some of its higher neighbors, but its western flanks contain perennial water and one of its side-canyons is known as an important refuge for migratory birds, for example see Bird Species in French Joe Canyon. Below, the northwestern slope of the mountains viewed from the upper reaches of Mescal Road on August 31, 2008. Apache Highlands Grasslands are visible here, with a mix of rich grass stands and woodland. Click on the image to enlarge it. The Whetstones are part of the Coronado National Forest, and its weatern flanks descend in a series of parallel ridges-and-canyons into the Las Cienegas National Conservation Area, some of the richest grasslands in the Apache Highlands, supporting cienegas, cottonwood-willow riparian forest, sacaton grasslands, and mesquite bosques. It is also home to 6 federally listed species. To see a detailed assessment of conditions in the Las Cienegas NCA, see this link: LCNCA Grassland and Watershed Conditions 2005. For more details on locations, see the map at the bottom of this page. Below, a view of the mountains taken from the parking lot of Kartchner Caverns Park on May 17, 2005. Click on the image for a closeup of the tilted sedimentary strata. 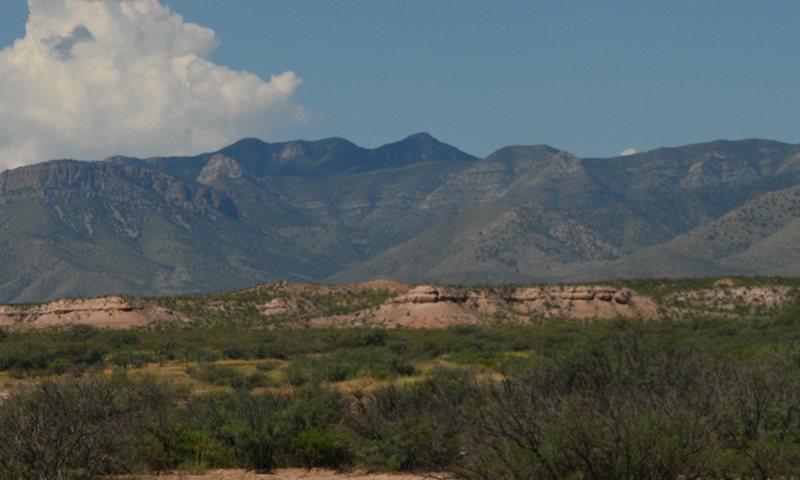 Geologically, the Whetstones, like other Sky Islands along the San Pedro River, are a complex mix of formations. The northern third contains Precambrian granites along with some Cretaceous sandstones, shales, and conglomerates. The southern portion, in contrast, forms a large tilted mass of Paleozoic and early Mesozoic sedimentary rocks, including both quartzites and limestone formations (along with some volcanic materials and granite intrusions). Tilted during the Basin-Range Faulting process 15 million years ago, some of its water-eroded Mississippian Escabrosa Limestone may be explored in the now-famous Kartchner Caverns Park whose entrance overlooks the river. 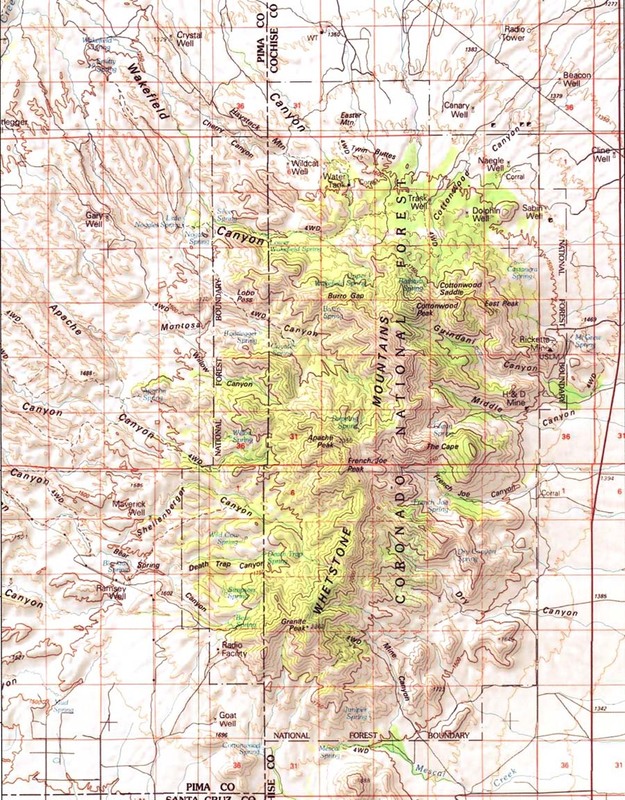 Below, Cienega Creek on the west flank of the Whetstones is just visible on this map at far top left. State Highway 90, which runs north-south past Kartchner Caverns, is visible along the far right edge.